Our enjoyment of certain archaeological sites very often depends on the extent to which a pile of rocks is transformed into a comprehensible ancient monument. Physically re-constructing age-old features has long been popular, but increasingly challenged by developing digital technologies. Sometimes, effective transformations of ruins are facilitated by more simple efforts. Read on for my favourite and truly ingenious interventions. Earlier this year the restoration of El Castillo de Matrera in Spain by architect Carlos Quevedo was decried as the World’s worst restoration. As criticism of the project on social media went into overdrive, Spain’s national heritage body, Hispania Nostra, said it was “absolutely terrible”. Was it really that bad? I don’t think so, there are more problematic re-constructions. What I think was at heart of the problem is that far too often we romanticise our ruins. We like their ruinous character, and when someone comes along and changes that, we are outraged. Increasingly, people are coming up with less obtrusive ways of transforming our favourite ruins. Allowing us to see what they looked at once, all the while still letting us enjoy the ruin. These are just three examples that have caught my attention. Rising more than 20 metres over flat, agricultural fields in eastern Austria is the Heidentor, or pagan gate. As imposing as this ruin is today, it is still only a shadow of its Roman self, a triumphal arch. From about 50 AD Carnuntum was a Roman Legionary Fortress that developed into a large and important city of around 50,000 inhabitants. Then, sometime between 354 AD and 361 AD a triumphal arch was erected just outside the city. Not that long after, in In 374 AD, Carnuntum was attacked by Germanic invaders. Attempts to restore parts of the city were not successful and eventually Carnuntum was abandoned. Like many other Roman settlements throughout Europe and beyond, the dressed stone provided a ready source of building materials to be used elsewhere. What wasn’t carried away, was eventually buried. Except for the triumphal arch. Although it too suffered and fell into disrepair, some of it stands proud. An isolated and fragmented monument to forgotten victories in a vast open landscape. For nearby Medieval communities it was the tomb of a pagan giant. Parts of the Roman city have been re-created for visitors, much like at other important archaeological sites. Using ancient building technologies and skills, experimental archaeologists have reconstructed certain features of a Roman city, including the house of a middle-class citizen and the public baths. But it is the extremely simple manner of enabling visitors to visualise the Roman triumphal arch that I think deserves special mention. 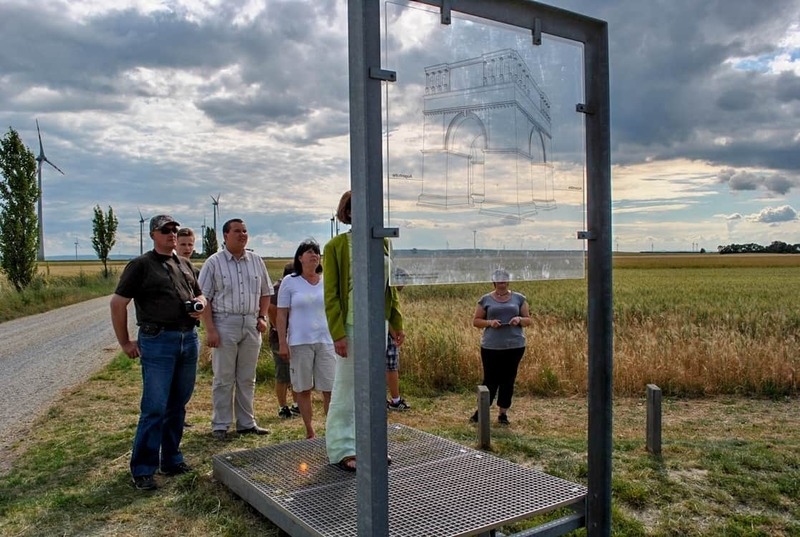 At the site of the Heidentor visitors get to see the standard information panels that explain the significance of the monument they are looking at. There is even a large model of what we think the triumphal arch looked like when it was built in the 350s AD. If these are not good enough, a line diagram of the triumphal arch has been etched onto a sheet of perspex, allowing visitors to stand in front of it and line it up with what still stands in front of them. Basic but ingenious. 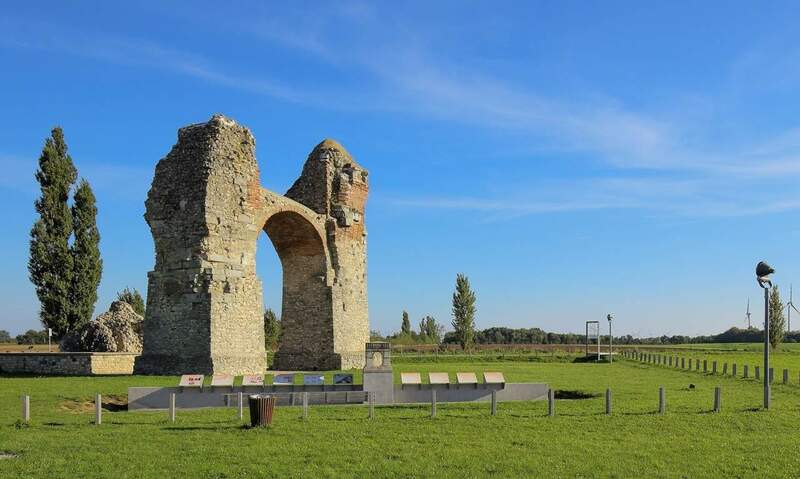 The ruins of Carnuntum extend over an area of 10 km² in the “Carnuntum Archaeological Park” that covers the present-day towns of Petronell-Carnuntum and Bad Deutsch-Altenburg, on the south banks of the Danube River in eastern Austria. There is much to see, including two amphitheatres, and a good place to start is the museum, Austria’s largest Roman museum. Some of the features can be visited year round, but the museum, with its extensive programme of activities, is only open between March and November, for details see the website. Let’s face it, for many the ruins of most Roman amphitheatres are a bit of a comedown against the Colosseum in Rome. Imagine then the task of having to create an interesting display out of the very meagre remains of the amphitheatre found underneath the Guildhall Art Gallery, London. But they succeeded, and some! 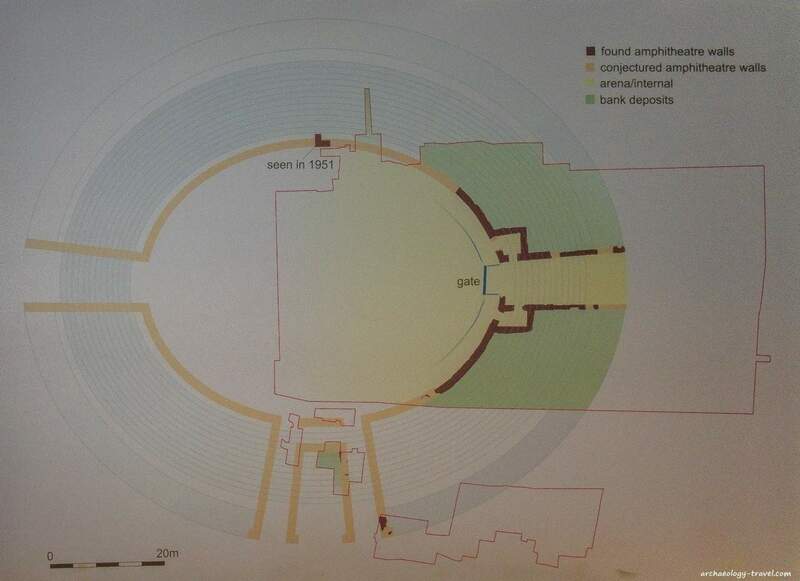 The above diagram shows a plan of the Roman amphitheatre in London. The thick, brown lines shows those walls that have been found during various excavations. The most recent being the 1985 excavation beneath the Guildhall Art Gallery. 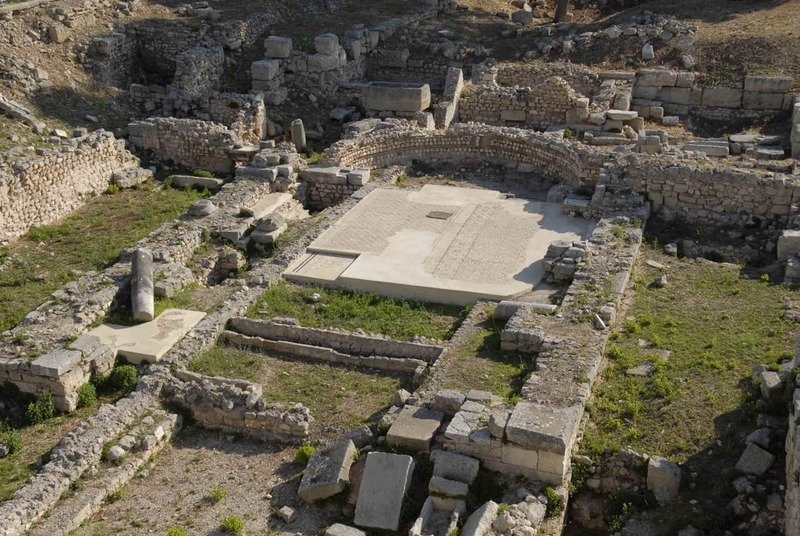 Archaeologists uncovered the remains of the eastern entrance to the arena. This includes the passage used to enter the arena, chambers on either side of that passage, the wooden drains that would have been below ground level to drain away water, as well as the timber threshold that would have supported the gate into the arena itself. As amphitheatres around the Roman World go, you could be forgiven for not being very impressed. 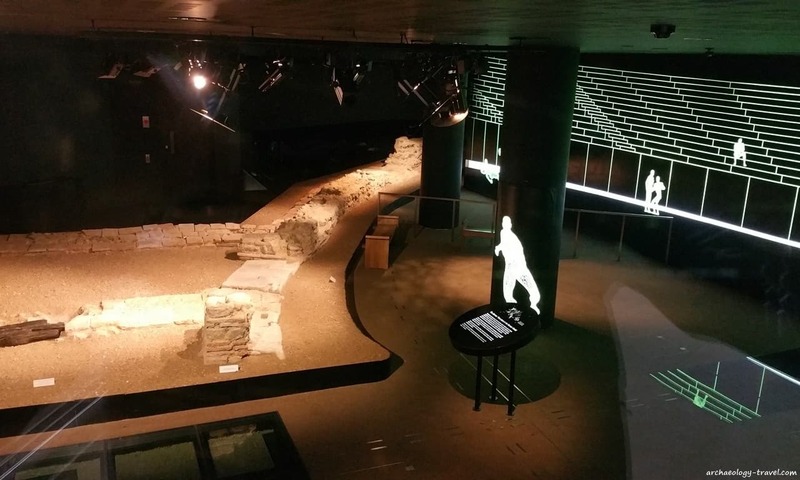 For the Roman archaeology of London, however, these meagre remains are significant; hence the reason why they were retained and a display created for visitors. But this is no straight forward display of low walls. Looking down onto the remains of the east gate. 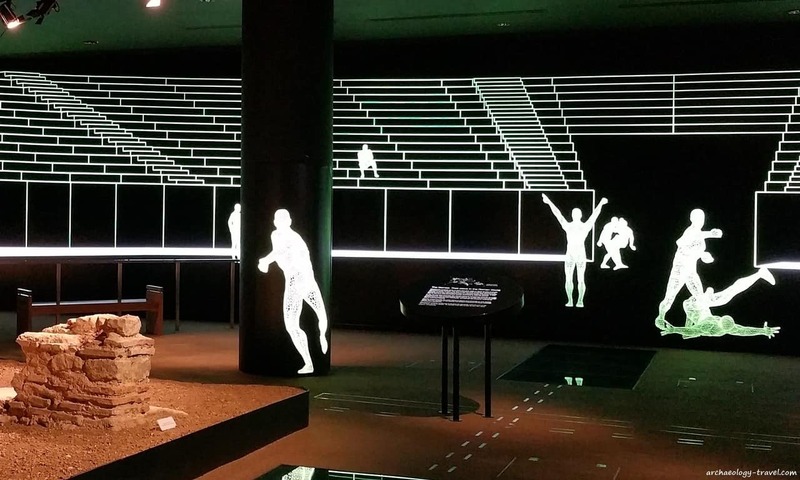 Out of the very little that remains of this ancient amphitheatre, the creators of Guildhall display have devised an ingenious way of ‘re-constructing’ the amphitheatre. And in so doing have enabled an interesting and engaging experience. As you enter the gallery, you are confronted with darkness. As your eyes start to adjust you notice the Roman walls are picked out with spotlights. Then as you walk up the passage you notice fluorescent markings on the black walls and columns of the gallery. These are outlines of humans and lines of the arena and surrounding seating. The wooden features have been preserved in situ and covered with thick glass. A truly simple but highly effective solution to re-creating the inside of the amphitheatre. Looking up the passage into the arena. 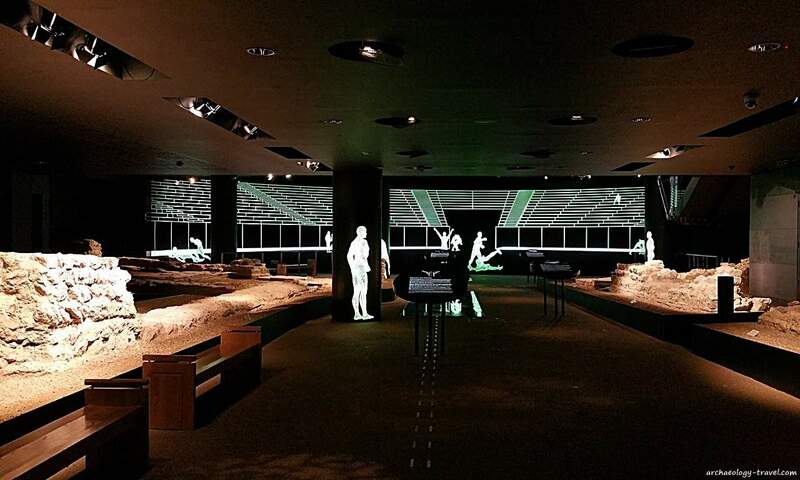 London’s Roman amphitheatre can be seen in the lower floor of the Guildhall Art Gallery. Daily admission is free of charge, from 10 am to 5 pm each day except Sundays when it is open from 12 to 4 pm. As the gallery is used for official and private functions it can be closed to the public from time to time, these dates are published in advance on the website, or call 020 7332 3700. Next to the Romanesque church of Santa Maria at Siponto (Puglia, Italy) archaeologists uncovered the remains of an earlier church, built when this town was a Roman port. Although interesting, the Paleochristian church is nothing exceptional. But it has been given an extraordinary make over. 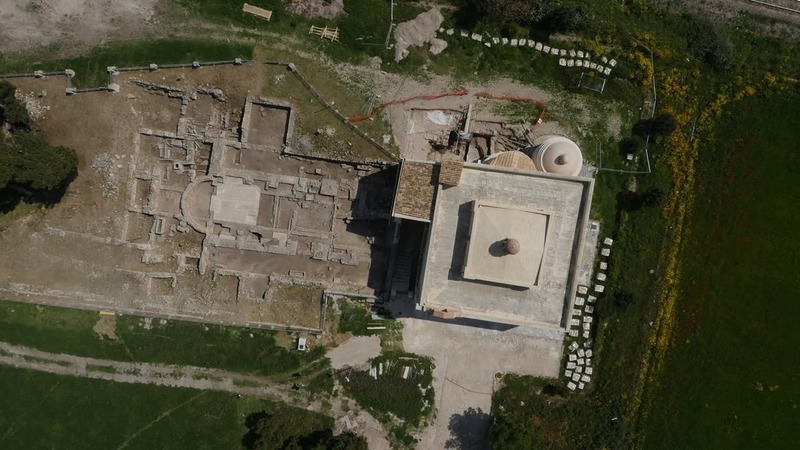 An aerial view of the paleochristian basilica and Sipontum. Like many archaeological sites where buildings are involved, the remains of Siponto’s early Christian church are best viewed from above. This is why the walls of ancient buildings are often re-built, it is an attempt to make the layout and structure more obvious. Instead of rebuilding the walls with stone, at Siponto the artist Edoardo Tresoldi has re-created the basilica with wire mesh. 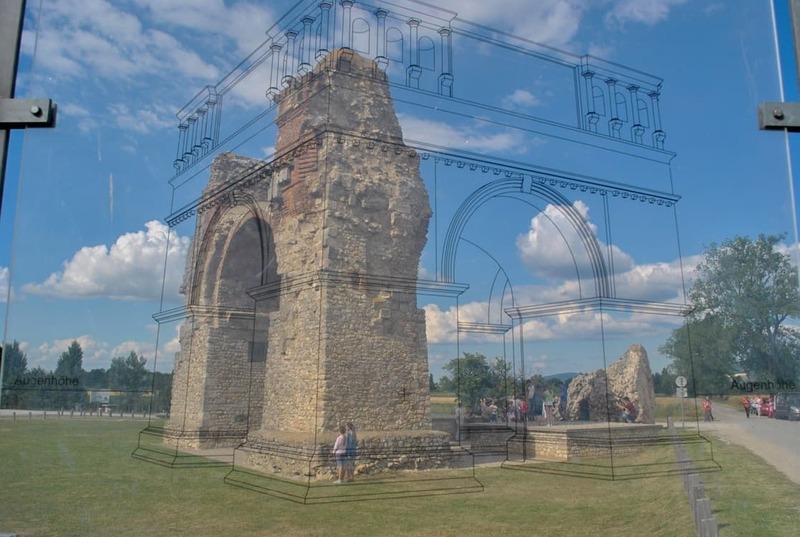 In this unique re-construction, we are at once able to visualise a complete basilica while still being able to enjoy the archaeological remains. Take a look at the extraordinary installation in the following video (only 1.50 minutes), or have a look at this extensive collection of photographs published by Blind Eye Factory. Inspirational projects all, respecting integrity of the site but providing lay people a much enhanced imaginative fuller experience of what is normally a two dimensional confusing often boring use of the heritage tourists time. Give your Cretan connection, I should admit I was tempted to mention Knosssos more than once.